The Horner Road Commuter Lot in Woodbridge, Virginia, located near Interstate 95, is a prime choice for thieves to strip cars and SUVs of their wheels and tires. 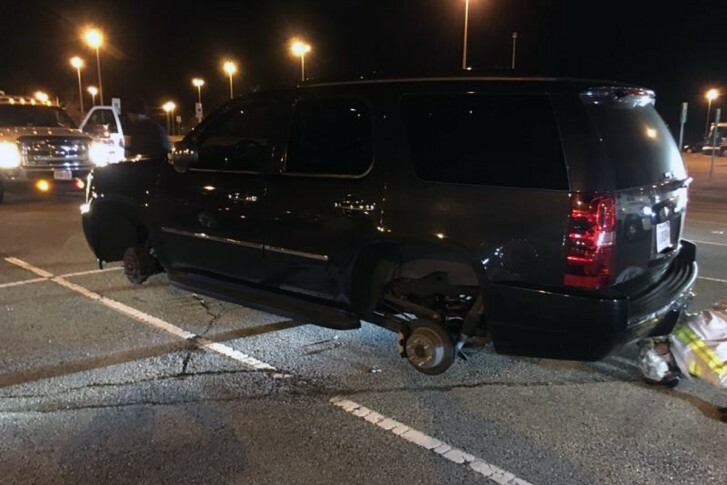 WASHINGTON — The Horner Road Commuter Lot in Woodbridge, Virginia, located near Interstate 95, is a prime choice for thieves to strip cars and SUVs of their wheels and tires. On Thursday, thieves hit again. Prince William County police say only one vehicle was targeted. This lot is one of the largest commuter lots in the state, and the stealing of wheels and tires at the lot has been an ongoing problem even though police patrol the area. Still, no one has been arrested for the crime. Several temporary security cameras have been placed in the lot since the last incident that happened in January. The commuters who park in this lot and either slug or take the bus to work return at the end of the day only to find their car or SUV stripped of wheels and tires. But a bill that’s waiting to be signed into law by Gov. Terry McAuliffe could help with security at commuter lots in Northern Virginia. Freshman Senator Jeremy McPike’s bill — Senate Bill 515 — would allow the Virginia Department of Transportation to set up food trucks in commuter lots in Northern Virginia. VDOT owns the lots. McPike says the vendors would pay fees which would go toward security cameras and maintenance.